Madurai is the oldest inhabited city in the Indian peninsula[ It is a city in the Indian state of Tamil Nadu and is the second biggest Municipal Corporation of Tamil Nadu(source: Encyclopedia). It is situated on the banks of the River Vaigai in Madurai district. The city is widely known as the Temple city, and is often also referred to as Koodal Maanagar, Cultural Capital of Tamil Nadu, Malligai Maanagar Thoonga Nagaram and Athens of the East. With a population of 1,374,838 according to the 2001 Census , it is the 2-nd largest city in Tamil Nadu after Chennai. Legend says that Lord Shiva appeared in the dream on the king, Kulasekhara Pandya. The king was amazed to see drops of nectar or madhu falling down of earth from Lord Shiva's matted hair. The "madhu" was so sweet that the place where it fell came to be known as Madhurapuri, which in course of time became "Madurai." Tamil and Greek documents record its existence from the 4th century B.C. Being in the heart of Tamil Nadu, Madurai has fostered an essentially Dravidian and Tamil culture. Famous for its cultural and scholarly pursuits, the city had an academy consisting of critics, poets and savants highly esteemed both by kings and commoners. It was in Madurai that three successful conferences of Tamil scholars called sangams flourished under benevolent royal support. Madurai is famous for housing one of the five traditional dance halls where Lord Siva, in his form as the Silver Hall or the Velli Ambalam. 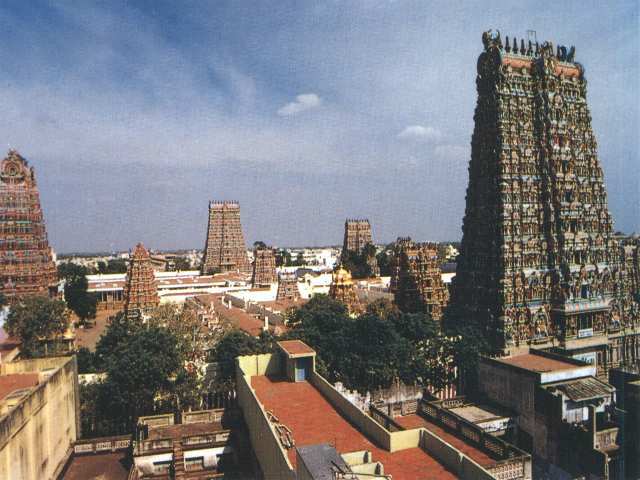 It is situated within the Meenakshi Temple. Meenakshi Koil Madurai was the capital of the dynasty. The Meenakshi-Sundareswarar Shrine is its central glory. The Muslims invaded Madurai in the 14th Century. Later it came under the rule of the Nayaks, and the rule of Thirumalai Nayak, who is remembered as the maker of modern Madurai, was an eventful one. Madurai was known to be the centre of learning and pilgrimage for centuries. Today, Madurai is a modern commercial and industrial city, with a vast University campus and is renowned for its weaving mills and dyeing industry. The chungadi cotton sarees are the speciality of this city with its colourful tie and dye motifs. Handicrafts, brassware, bronze items and the famous wooden toys of Madurai are some of the notable artefacts.Madurai is 450 kms from Chennai.